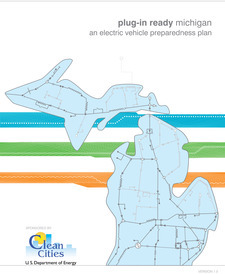 In the fall of 2011, Clean Energy Coalition was selected by the United States Department of Energy (DOE) to work with a coalition of more than 40 regional project partners to create an electric vehicle infrastructure readiness plan for Michigan. Clean Energy Coalition was able to work with project partners, NextEnergy and Greater Lansing Area Clean Cities (GLACC) to identify existing barriers and opportunities related to planning, zoning, codes, permitting, and utilities. As part of this effort, the team held a series of stakeholder meetings, completed a Michigan-specific forecasting study, and conducted a survey of Michigan’s municipalities to help gauge the level of awareness and on-the-ground readiness for electric vehicle deployment. Plug-In Ready Michigan provided the necessary information and tools for planners, local officials, consumers, and private enterprises to prepare for an increase in plug-in electric vehicle use. This project was supported by the DOE through the Clean Cities’ Community Readiness and Planning for Plug-in Electric Vehicles and Charging Infrastructure program. Under these projects, local public-private partnerships accelerated the deployment of electric vehicles and conducted public outreach and training in communities across the country. Since 1993, the Energy Department’s Clean Cities initiative has supported community-led efforts to deploy vehicle and infrastructure technologies across a broad portfolio of alternative fuels, helping to reduce America’s reliance on petroleum.